Freaky Factory is played with the mouse, which is used to detach the blobs of Kreludite from the line they're moving along at the top of the screen. Your goal in each level is to drop blobs of Kreludite into the appropriately-colored vats, which will automatically be used to produce toys once the vats are full enough. A display in the lower-right shows what colors the current batch of toys need, as well as how full the vats of those colors need to be and how many toys the batch will make. Once the toy quota (shown in the bottom left corner) is met, you will proceed to the next level. Blobs of Kreludite will fall with a trajectory determined by the speed they're moving; slower blobs will go straight down, while faster-moving ones will continue in the direction they were moving as they drop. If you drop Kreludite in the wrong vat, it will be emptied by the amount the blob would've filled, and a meter on the right indicating how much Kreludite you've wasted will go up. This meter is also increased by dropping Kreludite on the floor and overfilling vats, so keep the size of the blob in mind before detaching it. If the meter fills completely or you take longer than two minutes to meet the quota (as indicated by an orange clock at the top of the screen), it will be game over. Dropped Kreludite will also occasionally land on toys as they're being produced, changing their color, or on the head of the Grundo thief, neither of which adds to your waste meter. If not dealt with, either by dropped Kreludite or clicking directly on him, the thief will steal any toys he can reach. This will not only require you to make extra toys to meet your quota and cost you time, but will also reset the bonus you receive for delivering toys consecutively. In addition to the standard red, yellow, and blue Kreludite used to produce toys, you will encounter a number of mutant varities, which serve as the game's power-ups. Most of these will immediately activate upon being detached from their lines. The exceptions to this are the Evil Blob, which appears as a normal red, yellow, or blue blob of Kreludite with an evil face, and the halo-bearing Good Blob, both of which only take effect upon being dropped into a vat. The Good Blob has an additional effect if dropped onto a toy; see the Scoring section below for more information. 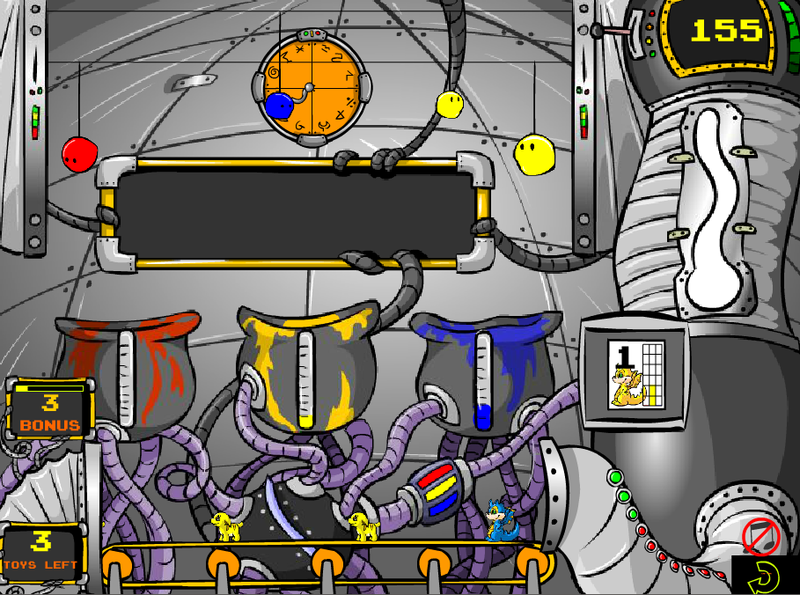 In Freaky Factory, points are earned by successfully delivering toys to the chute at the end of the conveyor belt. Each species of Neopet has its own point value, with primary colors (red/yellow/blue) being worth the base amount, secondary colors (purple/orange/green) being worth twice as much, and rainbow being worth three times as much. When a toy enters the chute, a meter will be shown on the Bonus panel above it. If another toy enters before the meter empties (which takes about one second), the bonus will increase and the meter will be refilled. Each consecutive toy adds the number it is in the queue (i.e. the first toy adds 1, the fifth adds 5) to the bonus, which is added to your score when the meter runs out or the current level ends. Because of this, it's best to keep all three vats of Kreludite as full as possible, to create a continuous stream of toys and increase your bonus. While you won't lose any points when the Grundo thief steals a toy, the empty spot on the conveyor belt will usually reset your bonus. There are also several bonuses that appear on the results screen at the end of each level. These are mostly used to award points for things that you would have been credited with had the level not ended.